In Germany, exclusively available at Sport-Tiedje! Cup holder and storage space for towels, accessory, etc. The Hoist Mi7 Smith Functional Trainer is a first-class multi-gym with an almost unlimited training variety. The Hoist multi-gym includes two components: a Smith Rack / Power cage, which you can walk through, as well as two cable pull modules with a 360° freedom of movement. This equipped is completed by smart extras as for instance five different chin-up handles, an individually adjustable back upholstery for core exercises or storing a bottle or a tablet. Hoist multi-gym with two components for an unbelievable variety of exercises. The Hoist multi-gym Mi7 Smith Ensemble combines guided and free movements thanks to cable pull and power cage. That's how you can manage the balancing of freedom and safety during the training. The extremely sturdy power cage with barbell bar offers highest safety during the training with the barbell. Due to the safety mechanism, neither training beginners nor advanced sportsmen do not have to fear any excess weight on the bar using high weights. The barbell bar can be freely moved in horizontal and vertical direction inside the power cage. That's why all classic barbell exercises are possible - from squats to deadlift or bench press. An appropriate weight bench is available as separate accessory. The 360° technology of the cable pulls allows for a lot of freedom of movement. You can specifically train certain muscles and do all training movements completely (full reange of motion) and maximise the effects. Every cable pull is equipped with aits own weight block of 68 kg. Upon request, the weight blocks can be upgraded. Each cable pull is adjustable in 28 height levels and allow for leg exercises as well exercises for the latissimus. 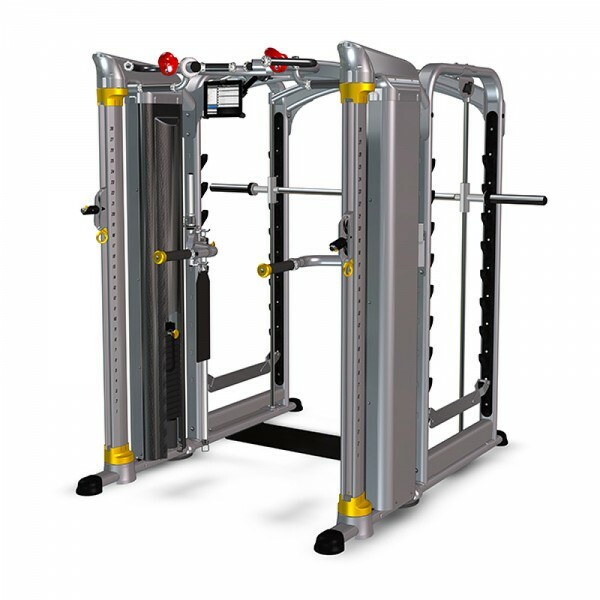 The design of the Hoist Mi7 is meant to offer a maximum variety of exercises on a very small set-up space. 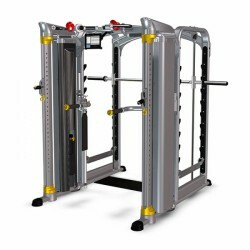 That makes it ideal for the fitness room at home or semi-professional fitness rooms, for instance at hotels or at a company. Both systems, cable pull and power cage, work separately from each other. That's why, the Hoist Mi7 can be used by two person simultaneously. The comfort of the Mi7 starts already before the training. That's ensured by the spacious holders, for instance for bottles, towels or the tablet, where you can watch your training videos. The possibility to do the training on the double crossover additionally with a back upholstery is a very smart feature. That's a comfortable support for many exercises for the core muscles. Taurus Hammertone Weight Plates 50mm In stock! Hoist additional weights for Mi7 In stock! Hoist multi-gym Mi7 Smith Ensemble add to comparison list.